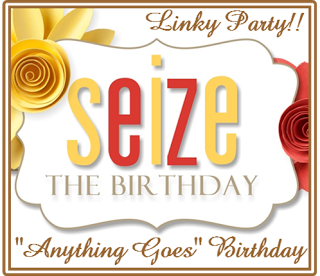 Procraftination: Seize The Birthday: Anything Goes! What you may not know, is that a member of our Design Team has a birthday today. She's sweet and talented and we're so fortunate to have her on our team! You can click on over to her blog Jodene's Cards & Creations to leave birthday wishes for her. For my card, I was in the mood for something bright and sunny. Patterns and the color orange are what I chose! I hope you'll play along with us. Now click on over to the Seize The Birthday challenge blog to see what the rest of the Design Team has created for your inspiration! Love this card Susie! The angled die is awesome! Super cute! Love the slant on the front. I love all of the triangles in the background and that bold happy sentiment! It really is a happy card! Bright and happy are perfect for a birthday card! Great card that is sure to make someone smile! I so agree with everyone...great card Susie! Love the slant and the layout of the card! Hope all is well!